Honestly, the best parts of the keto diet are the snacks. Sure, when you’re on the ketogenic diet -- a meal plan that requires high-fat, moderate proteins, and limited carbs -- you have to stray away from indulgent treats. Although debated, to ideally achieve ketosis, you’re only allotted 20-40 grams of carbs per day. You may be wondering what snacks can actually be good and light on the carbs. Where are chips and crackers? Where are the cookies? You might miss them at first, but then you'll realize that you can shovel baked cheese crisps hand over fist into your mouth, and you will quickly forget all about them. What other diet allows you to eat globs of peanut butter by the spoon and call that a snack? Or devour sizzling strips of bacon as a form of replenishing your body? 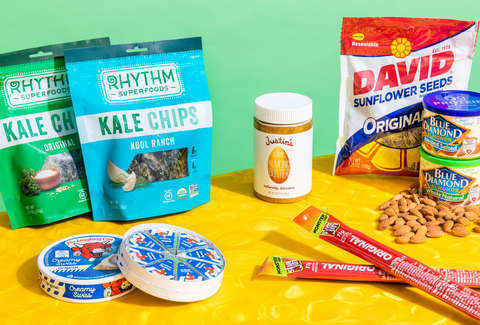 Whatever the craving, sweet or savory, meaty or nutty, here are 12 go-to treats that are keto-friendly for when you’re having a snack attack. Every time I go to Costco, the store is always running low on bags of this salty snack -- and with good reason. 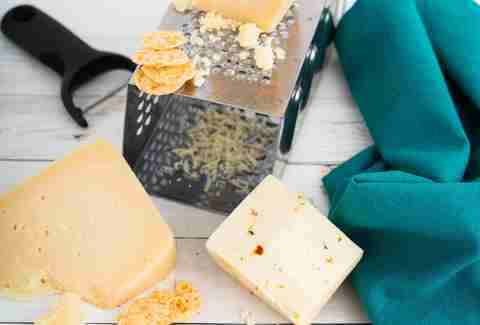 These keto-friendly baked parmesan cheese crisps are so delightfully crunchy and savory that it’s difficult to tear yourself away from the bag before downing it in one sitting. They’re 100% parmesan cheese and perfect for crumbling over a salad, crusting a protein, or lobbing into your mouth with reckless abandon. 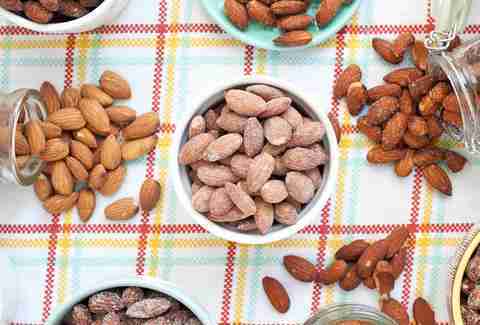 What is it about eating almonds as a snack that makes you feel like a healthy goddess? Blue Diamond makes it easy with its range of flavored almonds. For the purists out there, there’s whole natural almonds. To satisfy a sweet tooth, try the honey roasted. My personal favorite is wasabi, which packs a spicy sinus-clearing punch, and there’s also salt and vinegar flavor (if you’re into that kind of thing). Whatever the craving, Blue Diamond almonds are low-carb and high-flavor, so it’s a win-win snacking situation. 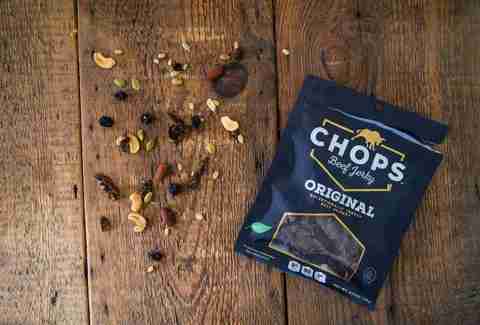 Chops’ beef jerky is made of 100% beef with no added preservatives and no MSG. It’s just pure, beefy goodness marinated overnight in a variety of classic flavors, like teriyaki and red chili. That being said, their original flavor is satisfying in its simplicity and the jerky isn’t the tough, jaw-numbing kind you’ve come to expect. It’s good, it’s simple, and best of all, it is keto approved. 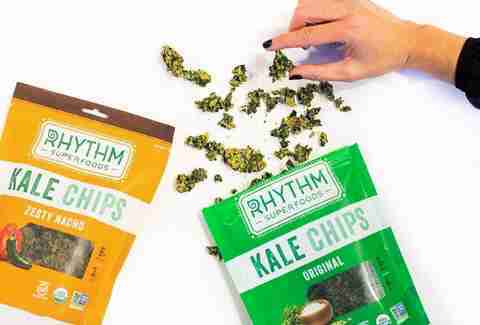 These kale chips by Rhythm are “dried, never fried,” so they must be good for you. Top that off with the fact that these come in classic chip flavors, like “Kool Ranch” and “Zesty Nacho,” with no genetically modified ingredients, and you have yourself a winning snack. It’s not Doritos, but it’s as close to carb-friendly Doritos as you can get. All hail kale! Laughing Cow cheese makes keto snacking so easy. 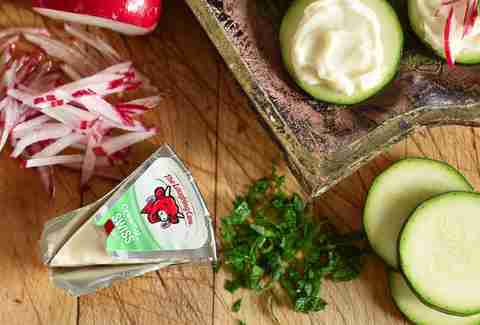 The luscious, creamy triangles of cheese are already conveniently portioned out for you, and you can’t help but smile looking at their grinning cow mascot wearing cheese wheel earrings. Eat it straight up or spread some on other low-carb snacks, like jerky or veggie chips, for a makeshift charcuterie plate. And honestly, though this may sound weird, Laughing Cow spread on bananas is actually heavenly. 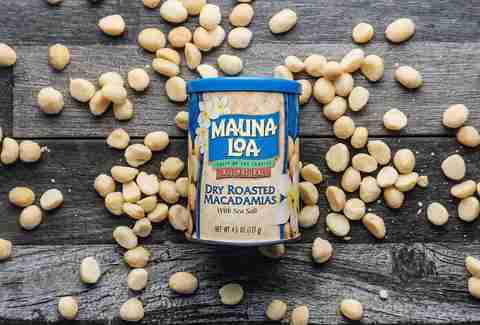 Mauna Loa macadamia nuts are so buttery and creamy that it’s easy to forget you’re snacking on a bunch of nuts. These high-fat nuts pair perfectly with a keto diet and are said to reduce your risk of heart disease -- which is just a small added bonus. The best part about Mauna Loa’s is that you can choose for a range of flavors; from Maui garlic and onion to honey roasted to original salted, you can tap into all the tastes of your dreams. 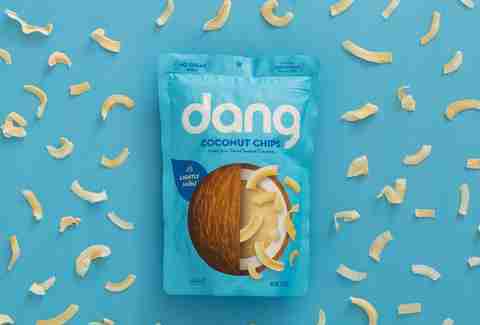 Dang, these coconut chips are good (I’m so sorry). Dang toasts whole fresh Thai coconuts until crispy and flavors them with either salt, caramel and sea salt, or chocolate and sea salt. There’s also the original flavor which is unbeatable in its delicious simplicity. All I know is that if your Thai mom’s recipe is the inspiration behind your snack -- like Dang’s is -- it’s bound to be good. 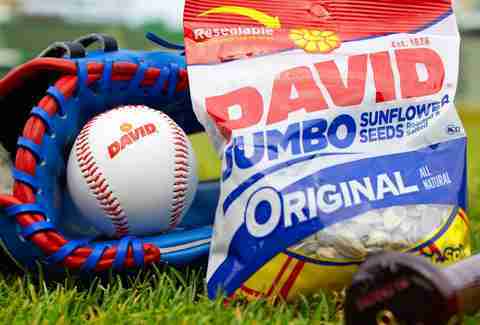 Ah, these take me back to my softball days. I never really nailed down the whole “crack-the-shells-in-your-mouth-and-eat-the-seed” bit but went through a bag of these every game regardless. Sunflower seeds are high in the good fat that fuels you during a keto diet and they’re also fun to eat. Get the ranch flavor if you love yourself. They’re crispy and they’re 100% little balls of cheese; what is not to love? 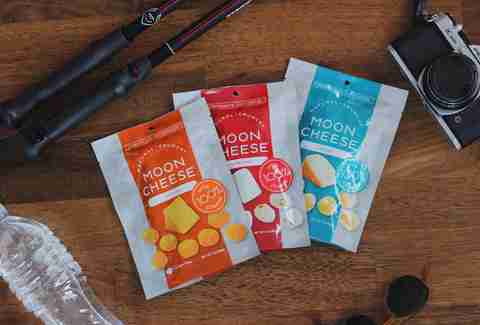 Moon Cheese comes in all your favorite varieties -- gouda, cheddar, mozzarella, pepper jack, and sriracha -- for gluten free, low-carb snacking. If eating balls of cheese hand over fist is wrong, I don’t want to be right. Is it acceptable to just eat a scoop of nut butter as a snack? On the keto diet, yes. 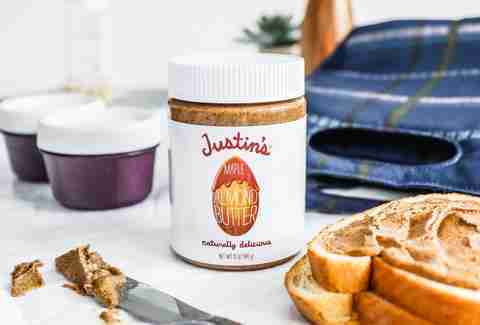 Justin’s Nut Butter makes it easy with their prepackaged portions, crafted with all your beloved nuts like peanuts, almonds, and cashews. Squeeze your choice favorite on to a celery stick for the best throwback snack or just directly into your mouth because you have no shame. 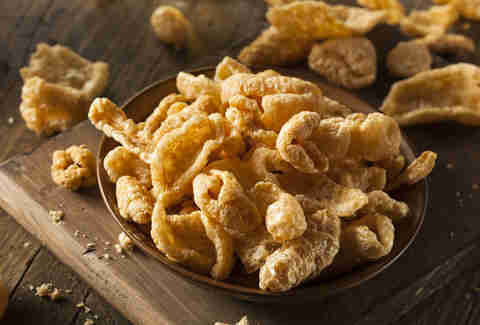 I don’t miss potato chips or tortilla chips if I have a jug of pork rinds in front of me. Utz makes them just right: lightly salted with an audible crunch. Dip them in nacho cheese, salsa, and guacamole, or crumble them over your salad; you’ll never miss those spud-heavy chips again. 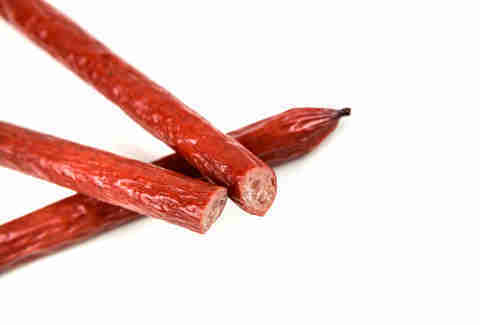 Slim Jims are the ultimate road-trip-gas-station-convenience-store snack and it’s a blessing that these bad boys also happen to be keto-friendly. You can’t go wrong with that signature pepperiness and -- dare I say? -- the juicy, oiliness of it. They’re high in protein and fat, but also sodium, so don’t go too crazy snapping into these meat sticks. Kat Thompson is a staff food writer at Thrillist. She thinks everyone should really try Laughing Cow cheese with bananas and tell her what they think on Twitter @katthompsonn.